Auto and related stocks are getting hit across the board today with retailers like AutoNation (AN) down 3.6%, on the heels of Penske’s (PAG) poor results, sending it down 7.5%, parts makers like Delphi (DLPH) down 6% and General Motors (GM) and Ford (F) down 3% & 4% respectively. I suspect broad market weakness being blamed on the potential for a push out from the March 1 deadline for new tariffs on Chinese imports is not helping. GM caught my eye this morning, first on the headline that the company issued an incentive plan to the leader of their self-driving unit Cruise if he were to sell or ipo the group within 10 years of the grant. This story obviously has few near term implications, but it might cause investors to start thinking about the story as a sort of sum of the parts, and start comparing it to the valuations that some investors are assigning to Waymo, Alphabet’s big “other bet” in autonomous, which some think could be worth as much as $100 billion. Investors will also compare to the soon to be public value of Uber, which many investors on the impending IPO this year will be buying for their plans to run an autonomous fleet in the next decade. You get the point, GM what has a $53 billion enterprise value and $145 billion in annual sales and trades at 6x earnings might soon be able to unlock some serious shareholder value! At least one trader was feeling down with it this morning, shortly before 11 am when the stock was $39, 25,000 of the March 40 calls were bought to open for 67 cents. These calls break-even in a little more than a month at $40.67, up 4.3% from the trading price, risking 1.7% of the stock price The options market suggests there is about a 33% chance of these calls being in the money on March expiration. 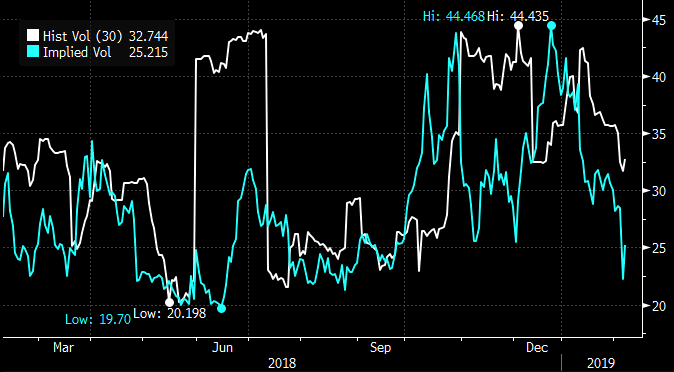 If I were looking to play for the long side I might consider short dated calls of call spreads especially after the stock’s 15% gains year to date, into what might be a volatile period as it relates to headlines related to global trade. But it might make sense to elongate the time horizon to April expiration, with the stock at $38.50, the April 40 / 44 call spread costs about 80 cents, risking 2% to possibly make up to $3,20, or 8.3% of the stock price if it is $44 or higher on April expiration.